Stove cook tops come in several types: electrical coil, gas burner, and flat ceramic. An electric Stovetop Range is a kitchen appliance that uses electricity to heat up heating elements that are on the top surface of the unit, where pots and pans that are placed for cooking. If your Stovetop Range has natural gas or propane piping connected to it, then you should put a checkmark for 'Stove (gas)' instead of 'Stove (electric)' in your Home Wizard app. Some models will have just a Stovetop Range by itself, however some models will be integrated with a Stovetop Range on the top and an Oven below it. If you have a model that has a combined Stovetop Range and Oven, then you should put checkmarks for BOTH Stovetop Range (electric) and either Oven (electric) or Oven (gas) in your Home Wizard app, depending on what type of Oven that you have. Fire Extinguishers, Oven (electric) and Oven (gas). Shown in the 'Routine Care' section are the recommended routine maintenance tasks for your stove cooktop (electric). The 'Q & A' section shows answers to common questions. 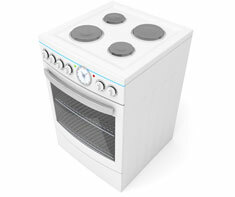 And the 'Articles' section provides helpful articles about your stove cooktop (electric).